Tomorrow’s launch of the Scottish Government’s White Paper will take political centre stage. As Dennis Canavan said at the opening of RIC 2013 there may be disagreements on the content but “we need to keep our eye on the ball”. The White Paper will be the Scottish Government’s road map to Indy and the ball is currently at their feet. We’d do well to keep an eye on both. Before the political landscape becomes swamped by the White Paper’s prospectus for Independence here’s 10 RIC 2013 afterthoughts, gathered together in the cold light of a cold Monday morning. 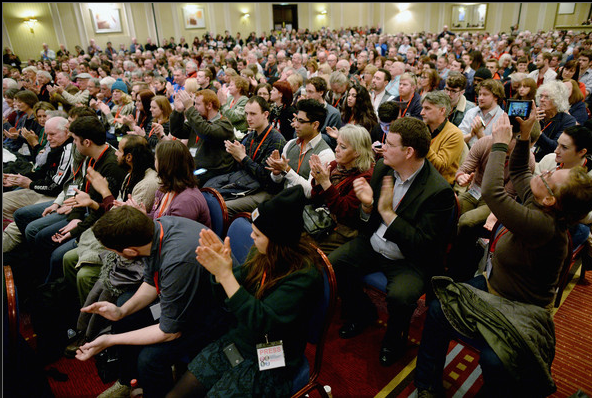 The size of RIC2013 was significant. 1000 accredited participants suggest the Scottish radical left is in vigorous health. Even the socialist left has recovered from the Sheridan debacle of 7 years ago and it was good to see so many old faces, with their batteries recharged. It was interesting too (for me) comparing RIC2013 with the early days of the Scottish Socialist Party. In 1998 I was involved in the creation of the SSP. The SSP had a similar pioneering sense of purpose when it was first formed but it drew from a much narrower social base of activists than those at RIC. By way of contrast, in three decades of political activism I’ve seen nothing in Scotland comparable to the bandwidth of experience of the activists gathered at RIC; their disparate backgrounds in activism, nor anything with such genuine intellectual weight. There was a tangible sense of shared purpose at RIC2013 and much camaraderie too. People seemed to enjoy being involved with something bigger than the sum of its component parts. Participants, even old adversaries, clearly enjoyed being in the same room as others with different approaches, priorities, or organisational backgrounds. Unlike in the early days of the SSP (or Respect in England) there is no jostling for control of RIC between groupings or factions. Nor is there a tub thumping demagogue or egotist who wants to be the public face of the project. The organisers to their immense credit facilitated a meeting of equals rather than putting their own agendas first. The professionalism with which RIC was organised was impressive. Everything ran smoothly, credentials were prepared in advance, stewards kept everyone informed and directed to the place they were looking for. You got a sense that the organisers wanted to be judged by the smooth running of the conference. The focus really was on facilitation rather than political control of proceedings. For me this was a revelation. I know I’m harping on about this but when you’ve seen at close hand the exact opposite eroding a sense of common purpose there is joyous appreciation from this auld heid. Already RIC2013 has outgrown its current format. Such was the scale of participation the policy workshops had 100+ folk attending and felt more like mini public meetings. As a consequence the number of people who took part in meaningful debate was limited to a small minority. It will take imagination, ingenuity and creative use of technology to overcome this problem in the future but its a fine problem to have. As the day progressed the opening plenary session seemed a bit old-fashioned in comparison to the more focussed meetings that followed it. There were too many speeches steeped in the old leftist tradition of pulpit oratory. I’ll declare my hand. I’m no fan of tub-thumping orators. I’ve heard enough Scargills, Sheridans, Galloways, Obamas, etc to last me a lifetime. I switch off as soon as indignation-by-numbers begins to assail ma lugs. Oratory is a party trick based on emotional manipulation of crowds, its easy to learn, and shouldnt be confused with passion. Middle aged male tubthumpers who cut their political teeth in the 1980s could take a leaf out the book of young women like Cat Boyd and Saffron Dickson. They were inspiring simply by being themselves and talking straight from the heart. This is probably contentious among older leftists but there ye go. I went to this meeting expectantly but was a wee bit disappointed that too much time in the opening speeches were broad brush generalities that everyone already agreed with. It took a contribution by Alan McCombes, who works for the John Muir Trust, to provoke some much-needed debate on specifics. He challenged the idea that corporately-owned wind farms were a good idea, and that building them on precious natural resources such as peat bogs was irresponsible and counter-productive. Community ownership of renewable energy sources may be an area of conflict post-Yes, as Scots try to take our country back from corporate control. I’m glad Alan raised this and having seen what corporate wind farms – bringing little benefit to local communities or the natural environment – have done to the Flow Country of my native Caithness I tend to agree with him. The session on women and independence was a breath of fresh air. The all-female panel spoke as if they hadn’t spent years spouting party political lines. Which they probably hadn’t. Each of them challenged conventional wisdom and this listener went away thinking about the ideas aired, much more so than from any of the other sessions. We’ve got a massive task winning risk-averse women to the idea of Independence which means listening (a lot) and doing things a bit differently. Fighting talk, verbal warfare and political abstractions are likely to be counter-productive to winning this key demographic (52% of the population). For my money Robin McAlpine and Lesley Riddoch are two of the most powerful intellectual forces driving Scotland’s reshaped radical left. They are to RIC what Alex Salmond and Nicola Sturgeon are to the SNP. This isn’t because anyone has elected them to positions of spokespersons but because Robin’s work with the Common Weal project and Lesley’s work with Nordic Horizons contain the outline of a radical new Scotland. Their contributions at RIC2013 were the highlights for me. What gives their social and economic ideas such gravitas is that they’re drawn from best practice among our nearest neighbours across the North Sea. These are practical ideas that have a working pedigree. The response to Robin’s closing remarks was interesting in itself. It was the nearest thing to a standing ovation. Those present clearly respect his work and understand the centrality of the Common Weal project to RIC. 9. SO WHAT COMES NEXT? Who knows! The best thing about RIC is that no one really knows where it’s going next. It has no preconceived organisational structure in mind for the future. Nor is there an agreed platform or manifesto. Instead there is a sense of adventure and spontaneity just as there’s space for experimentation. When RIC reconvenes next year everyone present at RIC2013 will be hoping, and working hard to ensure, we should aim to be convening, in the words of Robin McAlpine, “as the architects of a new Scotland” rather than a radical protest movement. Think about it long enough and it should tingle the hairs on the spine of any serious Scottish radical. By all accounts National Collective held a fine aftershow party in the Old Hairdressers. There’s nothing like a good party to end a good conference and build friendly working relationships for the year ahead. Sadly this former party animal was too knackered to party and was tucked up in bed early. I mean, pacing myself. Aye. Pacing myself. Good report Kevin. I agree your comments about Robin McAlpine and Lesley Riddoch. Their contributions are massive and deserve the highest praise. Speaking of praise. Allan Little’s programme on “Our Friends in The North’ was excellent, despite my earlier thoughts that it would be a hatchet job. I just wonder how it got past the BBC censors! Look out for the howls of protest from the No campaign. Absolutely David. Essential viewing for anyone who wants to know if there’s a viable alternative to neoliberal UK across the North Sea. It really, really, really is just about time that this was said. When I vote yes next September it will be because I want an independent Scotland, not a New Jerusalem. The day before the White Paper is published and the Monday after the RIC the Tories kicked in their latest attack on the poor and dispossessed by subjecting the Highlands to their social security “experiment”. I’m an SNP member and I attended RIC for the first time with my wife. She is an American, and not an SNP member. She shared your concerns about some of the logistical arrangements and suggested that there might even have been some H&S issues. The perils of success, I suppose, to give it a positive spin. I think your appraisal of the gathering is a fair one: there was plenty of adrenalin and lots of honesty, but some logistical details need a little more attention if the movement continues to grow (as I hope it will, and quickly). And good manners, please. Give Mary McGregor a slap on the heid, and remind her that the Romans are the enemy.